Writing a book involves a lot of thinking from a different angle. While we read a book sometimes we fail to appreciate the effort of a writer. So as a token of Thanks for writing and introducing us to all different world we have started the Superhero with Ink series. And today the superhero badge goes to Ravish. 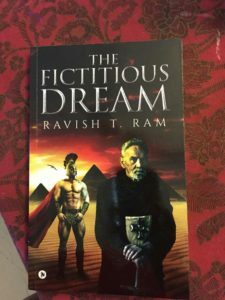 The name of my book is ‘The Fictitious Dream’. And it is all about a dream which the protagonist has but he is not able to fulfil it in normal circumstances. Rak(the protagonist) wakes up one day to a different world altogether, where he is an inmate in a sanatorium – a place where the lines between sanity are insanity are blurred, and where he is forced to question what sanity is after all. He has to experience every facet of life in this new dream-like world into which he walks in as a mental patient and journeys through as a husband, a friend and a lover while taking up roles of a servant, a soldier, a prisoner, a fugitive and a leader of a crumbling kingdom. 2) Can you tell us about your Background? I’m from Delhi and I’ve done my English Hons. from Delhi University. Currently, I’m living with my parents, wife and kids. 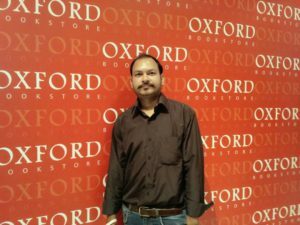 Since childhood, I have been a passionate reader and dreamt of writing a book. To me, dreams are an important part of life and most of the people succumb to the conditions and leave their dream behind and not happy at all working in something which is not at all related to the dream. This thought made me write the book ‘the fictitious dream’. Currently, I’m promoting my book along with doing my day job to support me and my family. I’m also writing another book on the theme of love. Book writing is something I long from an early age of 10-12 years. And when I was doing my graduation in English literature the feelings grew more and more to write books which not only entertain the readers but also give a message to them. Like most of the writers, I’m also an avid reader and writers like William Shakespeare, Paulo Cohelho & Chetan Bhagat inspires me the most. Currently, I’m working on another book, it is a romance book but with a touch of difference. There will be a whole new angle of love in it. I love watching Cricket, movies and listening to music, Punjabi and hip-hop music are my favourite. I love reading ‘Complete work of Shakespeare’ and I recommend it to every reader. Another book I recommend to every author is ‘Real artists don’t starve’ by Jeff Goins. It is a must-have book for every artist. Reading a book and writing a book is a completely different thing. Some people think that if they read a lot of books, they can write a good book as well but that’s not the case. Writing takes a lot of effort and of-course time too. When it comes to selling a book it is a totally different thing. Marketing costs a lot of money as well. So before publishing a book, be prepared to have a lot of money.